Click on any thumbnail to view the full-size version. More Pictures: Concert Pictures | Album Covers | Fan Photo-Ops | Autographs, etc. 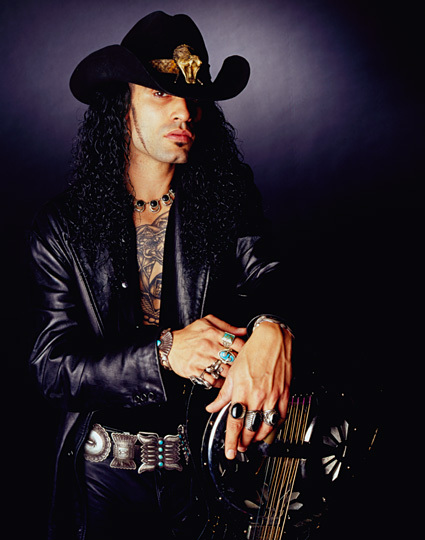 These are VERY large recent promotional photographs of Eric Sardinas (by Neil Zlozower). Robert Knight is the primary photographer credited on "Devil's Train." The credit isn't specific, so I don't know which pictures he is responsible for, but internet research indicates that his work includes the front cover art, and the famous "back tattoo" picture. Mr. Knight is the official photographer for Hollywood's Rock Walk, and six of his pictures were featured in The Kodak Rock Photography Collection of 500 of the Greatest Shots in Music History (1952-2002). During his career, Mr. Knight has photographed many guitar gods, including Steve Vai, Steve Lukather, Larry Carlton, Eric Clapton, Jimmy Page, Jeff Beck, and Carlos Santana. T. Dragan is arguably the photographer responsible for shooting the definitive black-and-white concert photographs of Eric Sardinas. He is credited as a photographer on "Devil's Train," and you may also have seen his work featured on Eric Sardinas' official swag. HELPFUL HINT: The last nine photographs below are linked to a single page, and were taken by T. Dragan at The 9th Blue Balls Festival in Luzern (2001). Jeff Dunas is the sole photographer credited on "Treat Me Right," and is responsible for taking the photographs that make up "State of The Blues" -- the gallery exhibit, e-exhibit, and book. Neil Zlozower is not only a legendary rock photographer, he is also on record as being a devoted Eric Sardinas fan. He recently shot the album art for "Black Pearls," and is also credited as a photographer on "Devil's Train." Unfortunately, although Mr. Zlozower permitted the use of one of his photographs on this site's homepage, he doesn't wish to have his work showcased on this page. That being the case, I can only point you in the direction of Google's cache of small thumbnails. What can I say? Zloz hits another home run... Or, rather, eight of them. HELPFUL HINT: Three of these pictures are available as larger and/or color images from skyemedia. I don't have any information on this photographer (or firm), and this is the only photograph of Eric Sardinas s/he has (they have) taken that I am aware of. Masa Noda is credited as a photographer on "Devil's Train," but I don't know which of the seven pictures (included on the CD booklet and jewel case back insert) he is responsible for taking.